Posted: Wednesday, August 8, 2018. 3:46 pm CST. 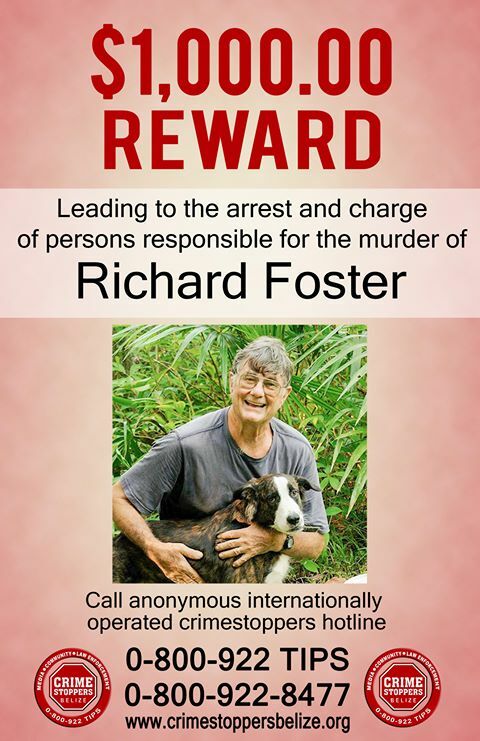 By BBN Staff: Crime stoppers Belize has issued a reward bulletin for $1000 for anyone who can lead authorities to the arrest and charge of the culprit/s responsible for killing British national Richard Foster. Foster was reported missing yesterday and by evening, police had found his missing Toyota Hilux. His body was found last night in the Rivera area of Belmopan with multiple stab wounds. The 74-year-old filmmaker made Belize his home for four decades working closely with the Belize zoo and focusing on conservation work. Foster and his wife Carol owned a natural filming base and studio at their home on Mile 28 ½ on the George Price highway. The Fosters made many documentaries for Natural Geographic TV and BBC . They won two Emmys and a numerous other awards for their work in Belize and worldwide. Anyone with information leading to the arrest of the culprits is asked to call crime stoppers at 0-800-922-tips.